Students at Goucher College in Baltimore drop a banner from the Mary Fisher Dining Center as part of the Student/Farmworker Alliance’s “Wendy’s, We Won’t Yield” National Day of Action on April 18, 2019. After passing a unanimous resolution to ban Wendy’s from campus until the fast-food giant joins the Fair Food Program, students at Florida Atlantic University in Boca Raton, FL, suspend a banner from the second floor balcony at the Ritter Art Gallery. The Community of Living Traditions and Stony Point Center raise their voices to support farmworkers’ human rights. UF Boot the Braids Campaign members drop Wendy’s Boycott banner at Turlington Plaza on April 18, 2019. Members of the UF Boot the Braids Campaign pose with a freshly-painted protest banner for the “Wendy’s, We Won’t Yield” National Day of Action on April 18, 2019. FGCU SFA prepares two banners to demonstrate support for the CIW’s Wendy’s Boycott on campus. DC Fair Food tabled at the Georgetown Farmers Market and Foggy Bottom Farmers Market on Wednesday, April 17. 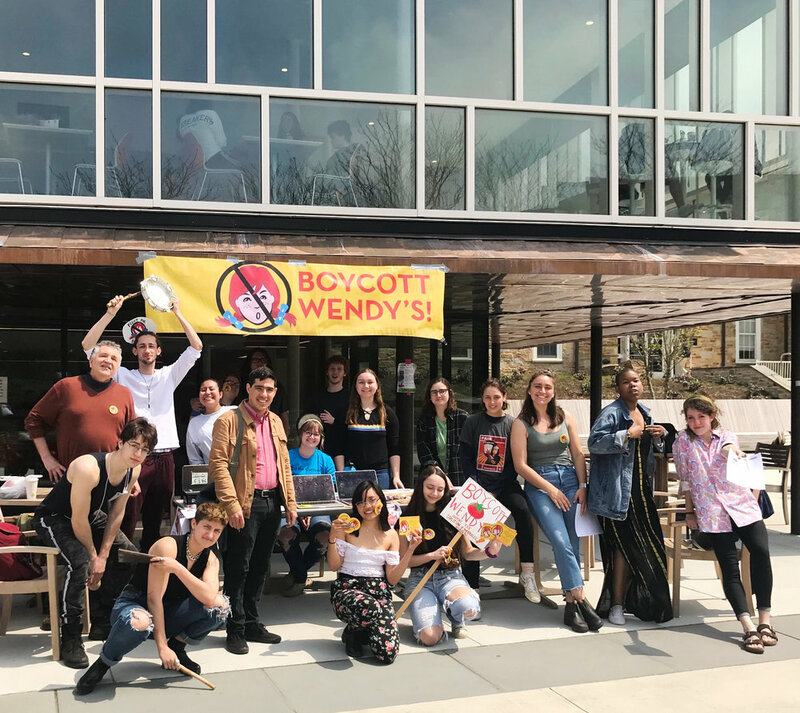 Scores of enthusiastic Georgetown and GWU students, as well as DC community members, learned about Wendy's decision to spend $25 million on their digital platforms while farmworkers remain vulnerable to abuses within its supply chain. New allies took photos with the "Wendy's, We Won't Yield" tweet print-out and were eager to join join the national Wendy’s Boycott! After a successful Food Chains screening on April 17, 2019, FSU SFA held a banner drop, accompanied with red balloons, to expose Wendy’s refusal to end sexual violence and forced labor in the fields. Movimiento Social Activista at U Idaho organized a colorful march from campus to the local Wendy’s restaurant in Moscow, Idaho on April 18, 2019. Faith United Church of Christ in Bradenton, FL, displays support for the Wendy’s Boycott during Holy Week 2019. And that was not the only highlight from last week in the Campaign for Fair Food! On Wednesday, the eve of the Day of Action, Rev. Dr. Liz Theoharis and the Florida Poor People’s Campaign brought their National Emergency Truth and Poverty Tour to the heart of the Fair Food Nation in Immokalee for a special teach-in with farmworker leaders of the CIW and a spirited protest at a local Wendy’s! In the last two years, the Poor People's Campaign: A National Call for Moral Revival has reached out to communities in more than 30 states, gathering testimonies, engaging in direct action, and chronicling the demands of thousands of poor people as they call for a more just and equitable society. Rev. Dr. Liz Theoharis, co-chair of the National Poor People’s Campaign, Florida faith leaders and organizers, joined farmworkers for a beautiful exchange of histories, campaign plans, and a shared vision to create a world without victims — a world where the human rights of all struggling communities are protected. 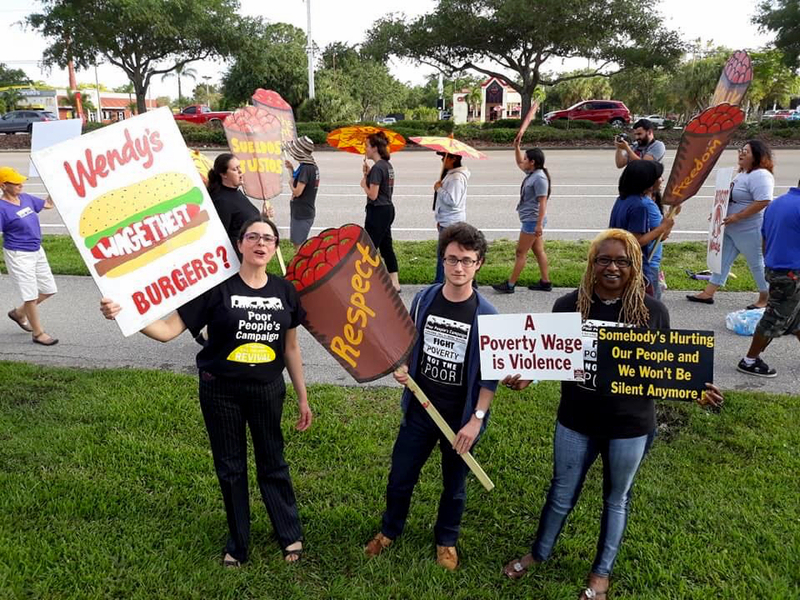 After the exchange, together with the CIW, the delegation led a joyous picket outside a Wendy’s restaurant in sunny Estero, FL, to demand a commitment to the Fair Food Program! It was an honor and privilege in Immokalee to host the courageous delegation from the Poor People’s Campaign, who are doing the critically important work in a democracy of speaking truth to power and stirring communities across the country to take action in defense of human dignity. We look forward to continuing to support each other’s struggles in the years ahead! Join the SFA network on Thursday, April 18, for a National Day of Action, where dozens of youth on campuses from coast to coast will drop protest banners and organize direct actions to demand Wendy’s show respect for farmworkers and consumers, and finally join the Fair Food Program. Check out SFA’s action toolkit, and be on the lookout for added resources this week on creative banner ideas, talking points, and more! If you’re ready to jump in, get in touch with us at organize@sfalliance.org or call 239-657-8311.